With hard work and determination, what started as a hobby for Bill Conkling grew into his dream job-making and selling wine. With hard work and determination, what started as a hobby for Bill Conkling grew into his dream job-making and selling wine. After graduating from the University of Northern Colorado, he worked at the Budweiser Brewery for 16 years. 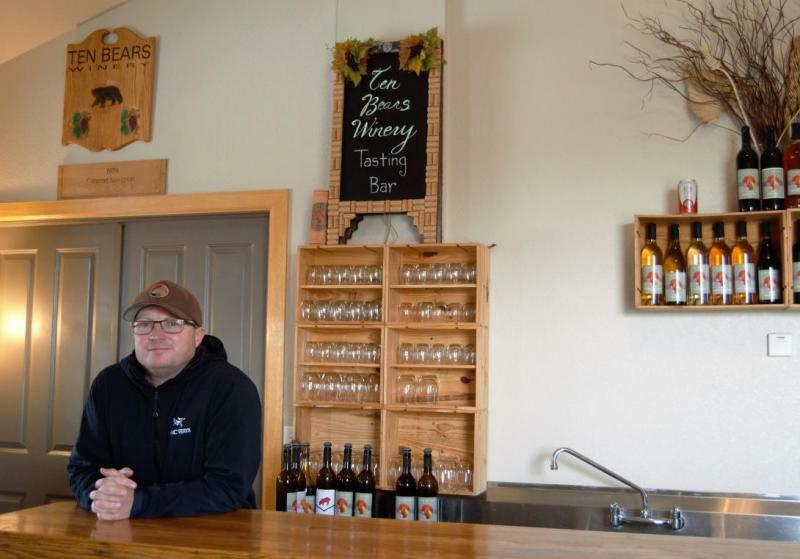 While he worked there, he found land tucked away in the northern part of Laporte and hired a friend of his to build a home and a building which now serves as his achievement- Ten Bears Winery. It is named after the road that borders one side of his property. “I always wanted to have fun while working and had a goal to work for myself,” Bill said. The winery bottles 23 different wines and one hard cider, using mostly Colorado grown grapes. He started the winery in 2006 while he still worked at Budweiser, but as the business grew, five years later he was able to leave the corporate world and focus all his attention on the winery. There is a tasting room, an outside area with a fire pit, and a modest-sized barn for small events. He is the only full-time employee, but he hires a few seasonal employees to help him during the busy summers at the tasting room. The summer season is also the time that he travels to wine festivals around Colorado, showcasing his product. Bill’s focus for his business is the quality of the wine. “A lot of places spend a lot of time and effort on their building and are selling products they don’t even produce themselves,” he explained. He focuses on producing flavorful batches of wine each year and prides himself in using almost all Colorado grown grapes. Marquette and La Crescent grapes are two types that Bill grows himself, both of which are cold-hardy grapes that can survive in the Colorado climate. These grapes can even survive in temperatures as low as -36 degrees. Fourteen other varieties of grapes, mostly from Colorado, are used to make the different types of wine as well. “When I’m doing inventory and planning for the wine, I’m looking two years into the future because it takes a year and a half to two years for the grapes to go from rack to barrels,” Bill explained. Colorado grapes grow and start to bud out in April and May. Depending on the kind of grape, the first batches of wine are made as early as the end of August through mid-October. The process starts with crushing the grapes in a fermenter, adding yeast, and circulating the mixture through a “punch down” method which is a gentle way to stir the wine that doesn’t add extra oxygen during fermentation. A press is used to squeeze the skins which adds more flavor to the final product. This process takes about two weeks. The second fermentation lasts for about two months in a closed container and lets the mixture go through an all-natural settling process. He doesn’t add any fining agents or additives to the wine. After transferring the mixture to the barrels, it sits and ages for up to two years until the wine is ready to be bottled. Six bottles are filled at a time through a gravity fed machine which eliminates the need for a pump. The bottling process lasts through the entire year. In the beginning, Ten Bears Winery started out with four types of wine. The inventory has now grown tremendously. Currently there are 23 different wines and one hard cider, and the winery has consistently been named one of the top five wineries in Colorado. “A lot of our clientele that visits are from out of town. Not a lot of local people know of us. There are a lot of people that live right around the winery that are loyal customers that come in regularly though,” Bill mentioned. He is happy with the size of his company and prefers that it remain successful at the manageable size that it is now.